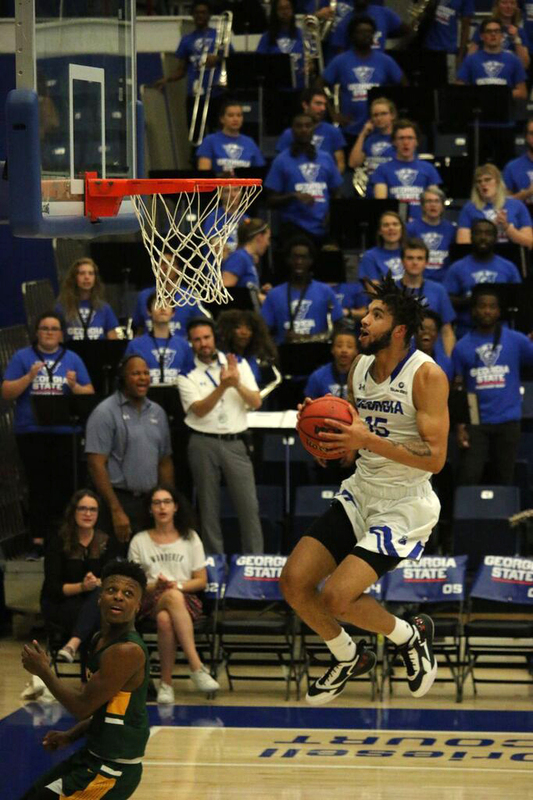 The Georgia State men’s basketball team played their final exhibition game at the GSU Sports Arena on Monday night against Coker College, and they did so in dominating fashion. Sophomore phenome D’Marcus Simonds nearly notched a triple-double in the Panthers’ 99-65 victory. Simonds had 31 points eight rebounds and eight assists. Simonds was named to the Lute Olson National Player of the Year list earlier in the day. Head Coach Ron Hunter was delighted with his teams’ effort against the Cobras. Outside of Simonds’ going 10-of-19 from the floor and 11-of-12 from the free throw line, the Panthers also received valuable minutes from redshirt-sophomore Jordan Tyson (nine points and 10 rebounds), Isaiah Williams (12 points) and Devin Mitchell (10 points). The Cobras proved determined to give the Panthers their best effort as they managed to go shot-for-shot with the Panthers during the early minutes of the first half. However, the Panthers went on a 14-0 run and held a 31-18 lead with 7:20 left in the first half. At the end of the first half, the Panthers had a 54-36 lead, and it was smooth sailing for the rest of the game. Senior forward Jordan Sessions played an integral part in the Panthers success defensively with his four blocks on the night. The Panthers finished exhibition play undefeated (3-0) and will face Carver Bible College on Wednesday at 7 p.m. at the GSU Sports Arena.